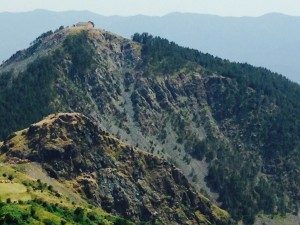 In July 2014, as on several previous occasions, Brian Lett, a former chairman of the Monte San Martino Trust, led a party of walkers on a four-day hike through the Rossano Valley, where his father was a celebrated leader of a group of international partisans. Here, Nicholas Gent, a MSMT trustee, reflects on the journey, and on the desperate plight in which this corner of Italy found itself during the Second World War. The Trail was organised by Brian Lett to commemorate the lives lost, and the sacrifices made, among the contadini and the Allied soldiers during the years 1943 to 1945. Brian’s father, Major Gordon Lett, commanded a group of international partisans, the Battaglione Internazionale, in the valley of Rossano during that period. We started in Pontremoli, a small town in north-west Tuscany, situated on the river Magra, and the Trail ended in Levanto, a charming holiday destination on the Ligurian coast. The Trail lasted for four days, culminating in a dinner in Levanto, on 5th July. It was based on Second World War escape routes used by Allied soldiers and by partisans, in an area occupied by enemy troops. We trekked a total distance of over 50 miles, in undulating and often rough terrain, at heights of up to approximately 1,500 metres. What was special about the Trail was that there were so many aspects to enjoy. There was the beautiful, wild and rugged scenery, the hills and mountains cloaked with chestnut and pine trees (the pines were introduced by the Venetians at the time of their maritime empire for making masts). Particularly appealing for me were the views of, and from, Monte Dragnone, which rises steeply to a height of over 1,000 metres, and which we scaled on our second day. I loved the early evenings when the temperature became cooler and the light less harsh, the light subsequently giving way to lengthening shadows and, finally, one saw the wild landscape almost capitulating as it morphed into silhouettes. Most of the villages we passed through were well off the tourist trail (Chiesa di Rossano is over half an hour’s drive to Pontremoli) and have made few concessions to tourism. In every village, the people were always very welcoming. In a way, the villages mirrored the landscape, being unspoilt and refusing to yield to the passage of time. This untamed beauty was only part of the experience, however. Almost wherever we went, there were echoes of the Second World War. 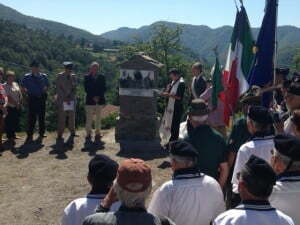 The wreath-laying ceremonies were very emotive, especially that relating to the new monument built just outside Brian’s house, in Chiesa di Rossano, dedicated to seven US and British aircrew. They lost their lives when their Dakota supply aircraft crashed into the hillside as part of Operation Galia, on 30th December 1944. It is too easy to forget that war entails logistical as well as military risks. I thought of the extraordinary and moving experience when I was with Brian in 2009, in Arzelato, a neighbouring village to Rossano. An elderly villager, on seeing Brian, got down on one knee and uttered to Brian “Maggiore, Maggiore”, thinking that he was addressing Brian’s father, who was highly respected as a partisan leader and British officer and commanded huge authority in the area. On the first day, we left Pontremoli for our steep ascent to Rossano. We followed the river Gordana and soon came to a bridge at Cavazzana Gordana, where we were halted by Brian. Three SAS soldiers, one of whom, Lieutenant James Riccomini, had an ankle injury, ran into a field of enemy-occupied bivouacs on the way to crossing the bridge. The bridge was the only means of crossing the river and the soldiers kept going even though there was a German column crossing the bridge the other way.The decision was taken to continue even though there was near elbow to elbow contact with the German soldiers. We re-enacted the scene, under the skilful direction of Brian. How chilling it must have been for those soldiers. Standing in the square in Sero, a remote mountainous village in Liguria, during the morning of our last day of trekking, gazing at the campanile, I thought about the violence this elegant building had witnessed nearly seventy years ago, in January 1945: the Nazi rastrellamento in the search for SAS soldiers and partisans, the subsequent occupation of the village and shooting of innocent villagers. I heard about Pippo, a partisan, who shot three Tedeschi from the top of the campanile and then managed to melt away into the countryside, even though surrounded by German soldiers; Pippo’s intimate knowledge of the area probably saved his life. hundreds of miles behind enemy lines, moving around treacherous paths on the wild mountainside during that very cold winter of 1944-1945; they had to move at night time to avoid detection. Their standard footwear was hob-nailed boots, liable to betray their movements as they were noisy and also lacked grip. During the Trail, I wondered what secrets were harboured by the wild and dramatic landscape that rolled out as far as my eyes could see, which would have been witness to some of the cataclysmic events that occurred in surely one of the worst periods of Italian history, namely the years 1943 to 1945. I thought of the massacre of the villagers in Vinca, also in north-west Tuscany, in August 1944, a village that I had visited a few years ago. As the men were at work in the fields, or in hiding, mainly women and children were murdered by Germans and Fascist forces in an attempt to suppress partisan activity in the area. No villagers survived; a total of 174 were massacred. I also thought of the much wider picture, the pain and suffering all the Italians went through. After Mussolini was returned to power by Hitler, just after the Armistice between Italy and the Allies in September 1943, Italy nominally had four governments, namely the Fascists headed by Mussolini, the Germans in the North, King Vittorio Emmanuele and General Badoglio, and the Allies in the South. The country lacked leadership and was subject to massive political and social turmoil; in addition, many large cities such as Bologna, Turin and Genoa were being heavily bombed by the Allies, resulting in civilian casualties and mass evacuation. The Trail was not without its humorous side: for instance, the Rossano dormitory, where we spent the first two nights, was subject to a cacophony of snoring; at one point I heard four men snoring at the same time (no names given!). In Sero, we slept on the floor of the church hall, surrounded by the most unlikely bedfellows ranging from gilded tabernacles and crucifixes to gym equipment. At six in the morning, the campanile bell started to clang and, as soon as we returned to sleep, we were awoken by a neighbouring church bell; I am not sure which bell told the right time. I did wonder if Pippo had heard the same chimes almost seventy years ago? I was left with the enduring feeling that it seems so tragic and sad that Italy had been dragged into a war that resulted in so much wanton destruction and disharmony, the repercussions of which are still felt to this day and are likely to reverberate for decades to come. The beauty of the country and the selfless and heroic offer of shelter and food by the contadini to the escapee Allied soldiers add to the sense of poignancy. We are very indebted to Brian for organising the Trail. Also, due to his passionate interest in, and deep knowledge of, the history of the area at the time of the Second World War, Brian has played a very important role in helping to perpetuate the memories of those countless acts of self-sacrifice, courage and heroism by the contadini. They neither sought, nor expected, reward. I so hope that this small chapter of history is forever remembered.